Have you ever seen the sun from East Bowl in the morning? Or touched the icy waters of Lake Willoughby. Have you biked down Mountain Road at first light? Or heard the brooks roaring in the spring. If you’ve done any of this, you’ll get it. If you’ve never been here, maybe you never will. Our four-season adventure hub provides endless outdoor adventures as well as exquisite indoor amenities to enjoy. We invite your groups to experience East Burke, Vermont. One of the greatest gifts of our little corner is the natural beauty and infinite opportunity for experience. Whether you like the outdoors or indoors, winter, summer, spring, or fall, our knowledgeable staff can point you in the right direction. 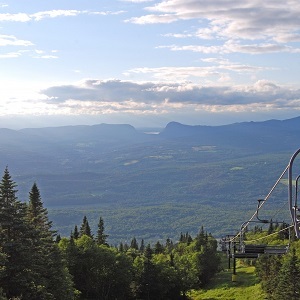 From skiing our 50 trails and glades, mountain biking over 100 miles of trails on or around Burke Mountain, hiking Mt. Pisgah, snowshoeing, paddling, swim-holing, paragliding….well, you get the point. There are a million little experiences to be had here in the Last Little Corner of Vermont. Guided Nordic skiing, showshoe, kayaking, hiking, historic discovery hikes, hang gliding, fishing, ice climbing, snow mobile, paddle boarding.